Winter’s a great time to feed the birds, but if that means feeding the squirrels too, they can quickly wear out their welcome. Squirrels can find or make holes in your house and nest there, causing damage for years before you realize it. Here’s how to uninvite them from your yard. Position your bird feeder where you can see it, at least six feet off the ground and 12 feet away from any trees or fences. 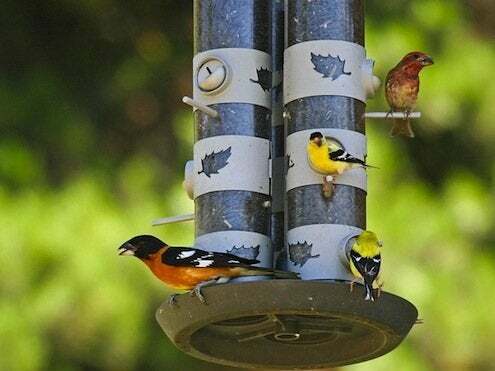 Pole-mounting or hanging feeders and adding mesh cages and baffles help, but rotating feeders that spin when triggered by the squirrel’s weight are usually most effective. Squirrels can and do chew through plastic and wood, so a metal bird feeder is your best bet. Scrub the feeder regularly to prevent the spread of disease among birds, and to keep rancid seed from attracting possums and raccoons. Both cats and poisons can backfire as squirrel deterrents, but cayenne powder mixed with the seed has been known to work; just be careful when you’re handling it!